eat well. heal the planet. Well, it’s the last day of Podcast Blitz Week! And, I am having so much fun sharing episodes with you, I think I’m going to keep sharing more than one per week. I may be too ambitious, but we’ll give it a try! So, from now on, look for new episodes on Mondays and Thursdays! 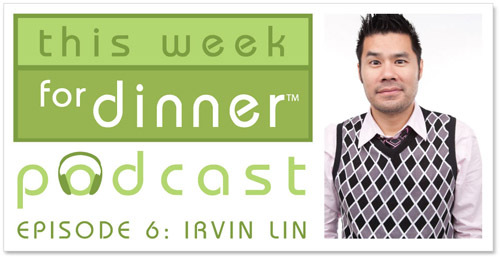 For today we have food blogger Irvin Lin from Eat the Love on the show. I think Irvin can be safely labeled a “foodie.” Data point #1: He lives in San Francisco. Data Point #2: When he sees weird produce at the store he buys it and then actually cooks with it. Data Point #3: He took a laminated dough classes. I rest my case! Irvin is a great guy and I had a blast chatting with him for the podcast. He shares TONS of food with us in this episode. He simply could not choose one favorite recipe or tip, so you are getting a feast of goodness from Irvin today! His other kitchen tips don’t have links…you’ll have to listen! It’s easy to listen to the show! Via the web: Just click play below! Via an app: For iPhone and iPad, subscribe to the This Week for Dinner Podcast on iTunes and listen to it through the purple Podcasts app. For Android devices, use the Stitcher, Podcast Addict or Pocket Casts apps. In all cases, launch the app, then search for This Week for Dinner Podcast. The benefit of using an app: once downloaded, you can listen to the show without an Internet connection. If you enjoy the podcast, please leave a review on iTunes! Big thank you to d&m for providing the music for the podcast! Thanks for having me on your podcast! So much fun! it WAS so fun, thank you, irvin! Welcome to This Week for Dinner! Hi! My name is Jane Maynard and you've landed yourself on my blog, This Week for Dinner™. Every Sunday I share a weekly menu...and count on you to share yours! You'll also find other deliciousness that I hope you'll enjoy! All images and original content on this site are the sole property of Jane Maynard and may not be used, copied or transmitted without express consent.